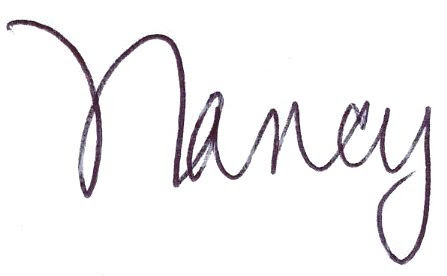 Welcome December. Although the days may be shorter and the light lessened, all is bright atNatureworks right now. 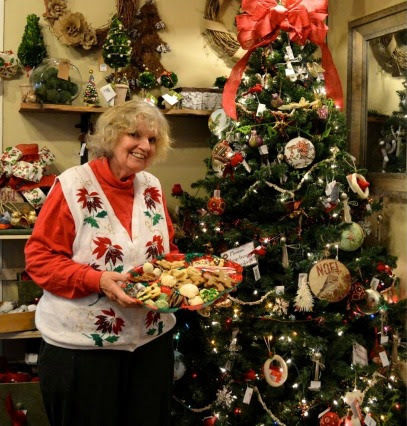 We are gearing up for our 32nd Annual Holiday Open House, a.k.a. COOKIE WEEKEND! Yes, Jane has been baking her famous cookies for days and days and we can’t wait till she arrives with a car load of cookie tinson Saturdaymorning. We will have hot cider, delicious hors d’oeuvres, and the wine will be flowing. 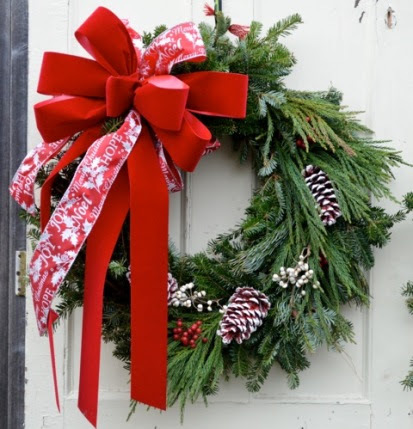 This is the weekend when our bins of greens areoverflowing, the yard is filled with beautiful fresh cut, premium trees, and the walls are covered with decorated wreaths. 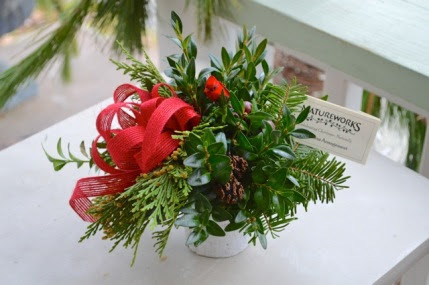 White tallow berries and fresh cut Cryptomeria make this wreath very special. This is THE weekend to begin your holiday decorating. I was off on Sunday and Monday and I spent many hours up on a ladder harvesting greens. I made a huge grapevine wreath which I will cover with greens, a bow, and twinkling white lights for my front porch- it is still a work in progress, but when it’s done it will welcome me every evening when I return home. I ventured into the cellar and my storage closets and started pulling out the boxes of Christmas linens, ornaments, and decorations. My tree goes up next Sunday, and I have to pick it out SOON. Our second shipment has arrived and they are all displayed and NAMED! That is one of my favorite things about December at Natureworks, listening to families decide on which tree to get. This is the first year we have used our greenhouse as a design studio. It is an amazing space to workin! Filled with ribbons galore, pre-made bows, cones, berries, and pods of all sorts, it smells wonderful and sparks creativity in all who enter. I tell people “This is where the magic happens!”. Instead of being inside the shop, stuck behind the curtain in the kitchen, Amber and I are right in the heart of all the action, surrounded by over 23types of fresh-cut greenery. Before they make it into our retail displays, they are bunched and dipped in Wilt-Pruf. This makes them last so much longer. It is a time-consuming extra step, but we know it’s worth it. New this week we have Cryptomeria, blue atlas cedar, and white tallow berries. We have all kinds of vintage doors on loan from Urban Miners. 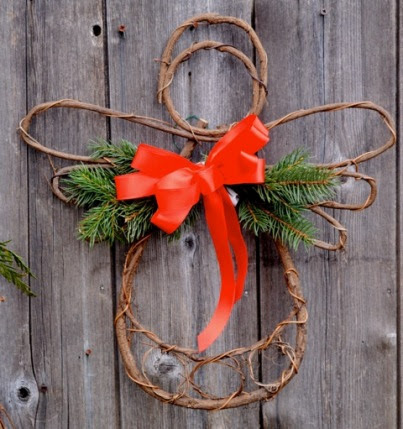 They make our wreaths really POP! 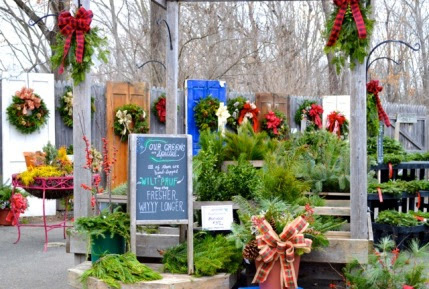 Besides wreaths, we make up our own swags, cemetery pots and pillows, porch pots, kissing balls, and custom roping using all sorts of mixed evergreens. Don’t like the bow we’ve chosen? No problem, we can switch it for you. 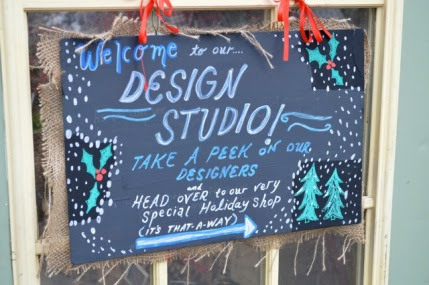 We welcome custom orders and are thrilled when the same folks return year after year for their special creations. These are the Natureworks traditions that make December so special to us. Inside the shop, my former design space is now being used to make terrariums, and LOTS of them! My staff astounds me with their ability towork their magic in these simple glass globes. 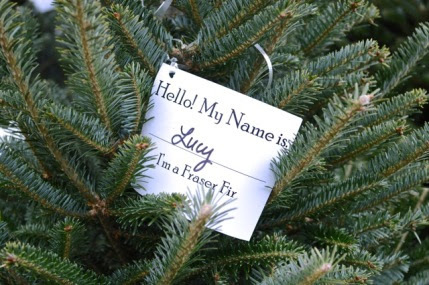 They are one of our most popular gifts, and, of course, they can be customized for the recipient. 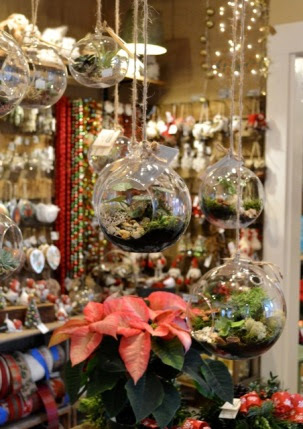 We restock our plants all the time, from Ittie Bittie foliage plants, to succulents, Cyclamen, and florist quality poinsettias, locally grown in CT. Also in the shop you will find tons of the coolest ornaments and lots of arrangements. Bigger is not always better when it comes to arrangements of greenery. One of our most popular gift items are teeny tiny arrangements. They are ordered in great quantities for office workers, teachers, grab bag gifts -anytime you need a little something fresh and unique. This weekend, we are asking our visitors to bring with them a bag of non-perishable food items for the North Branford Food Pantry. At our Open House, we supply you with delicious food and drink; in return, take this opportunity to give back to those who may not be so fortunate. Be an angel and bring a bag of non-perishable food with you when you visit. We will bring it all to the North Branford Food Pantry up the street. Thanksgiving is behind us and it’s TIME to start decorating. Light up your world with Mole Hollow candles, fresh scents, beautiful ribbons, and pretty flowering plants as December unfolds before us. Shop Small and rediscover how fun it can be to purchase thoughtful gifts from a business that truly cares about the environment and the community in which we dwell. I KNOW I will see you soon….